The php edition is the easiest choice to setup and run the Live Streaming application on a website and broadcast live video from webcam to site pages. Also use this edition to integrate with any php script or content management system that does not have a turnkey integration, yet. 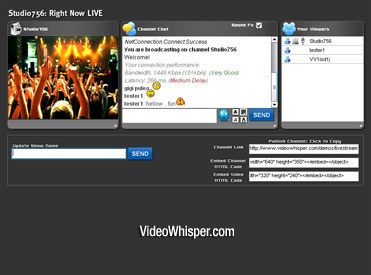 Supports web based interfaces for broadcasting live video, watching live video, text chat discussions with viewers. More advanced features like access and session duration control, tips for broadcasters can be enabled and integrated as needed. Delivery of plain live video stream using HTML5 is supported: as HLS for PC Safari and iOS/Android mobiles, as MPEG-DASH for PC Chrome and Android mobiles. This requires Wowza hosting for delivery and account level on request transcoding based on FFMPEG and flash/html5 codecs - all these requirements are available with our Wowza hosting plans. WebRTC HTML5 plain broadcast and playback is also available. This also uses the relay streaming server, meaning it does not require server grade connection for broadcaster and streams are available across all delivery formats (advanced Flash RTMP interface, plain HTML5 HLS/DASH, plain HTML5 WebRTC ). For a more advanced implementation see Broadcast Live Video , turnkey live streaming site solution that includes channel and user management, access control, advanced conversions, responsive features for automated mobile support. Test the multiple playback interfaces available (watch and discuss, only video, text chat, transcoder for HLS / MPEG DASH playback, WebRTC broadcast/playback). For enabling transcoding for HTML5 HLS / MPEG DASH playback required for iOS/Android delivery, special requirements apply: latest Wowza and FFMPEG with Flash and HTML5 specific codecs. WebRTC broadcast/playback require specific configuration and SSL certififcate for Wowza SE available with our turnkey stream hosting plans. To enable transcoding for HTML5 playback, configure HLS / MPEG DASH as per Wowza specs and fill httpstreamer & httpdash setting in settings.php . If you have Wowza hosting with us, our staff can assist with setting this up (our plans come with a rtmp address preconfigured for such usage). To integrate this with other scripts read an integration overview for videowhisper applications first, to understand the framework and where to start from. Broadcasting interface reports active broadcasters to lb_status.php. This also controls timer and can terminate session. On logout broadcaster is redirected to lb_logout.php . Included players report active watches to v_status.php which controls time and can terminate session. Edits this to implement ppv/ppm functionality for users watching video. You can also implement code to save a cookie (to check and prevent log back for a certain time) and disconnect by setting a custom disconnect message for user in $disconnect . Snapshots for all channels are saved in the snapshots folder as jpg. Size depends on webcam resolution. snapshots: &generateSnapshots=1&snapshotsTime=15000 Enable sending jpg webcam snapshots to server. &onlyVideo=0&noEmbeds=0&noTitle=0 Hide everything but video or just embed codes, show title interface. external text chat: &externalInterval=6000 Defines how often external chat messages are checked for (by calling vw_extchat.php), in milliseconds. Set 0 or any number lower than 500 to disable. Many of these parameters are also working with vv_login.php and vs_login.php for watch and video interfaces. Selectable tips are configured in tips.php and processing must be integrated from tip.php . Usage time limits are implemented in v_status.php (for viewers) and lb_status.php (for broadcaster). These close session with "disconnect" variable when time limit is reached. Sample implementation saves time usage counters in uploads/_users/$username for each viewer (on all channels) and uploads/$room/online/$room per room (broadcaster + all viewers). Solution implements WebRTC for streaming to/from media relay server. This brings compatibility for some HTML5 mobile browsers, to allow streaming directly from site without configuring stand alone encoder apps. Media server is still required and used as a relay for scalability, reliability and cross protocol stream availability. Relay server also manages sessions and advanced interactions in real time.